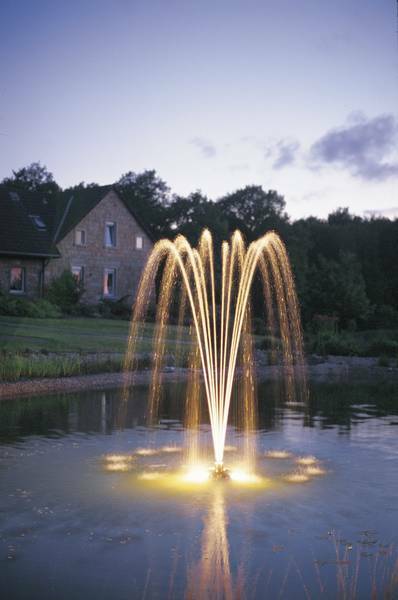 The Oase PondJet fountain provides a tranquil display for smaller ponds up to 1/10th of an acre (5,000 square feet). Click here for larger fountain options. This pond fountain is easy to install. Quality German engineering and heavy, rare-earth-magnets virtually eliminate fountain pump noise and ensure extended fountain pump life. Just got this and it was easy to set up. Plugged it in along with the light kit and we were up and running. I would definitely get the mooring kit to keep the fountain stationary. The only reason that I gave 4 stars instead of five is the fountain could be a little more powerful. My pond is about 40 feet by 60 feet so the spray is a good size. If my pond were any bigger, I would definitely want something a little bigger.